President Donald Trump chose the Republican governor of Kansas to lead American government support of religious freedom across the world. Brownback, like Trump, is a Republican. Brownback, who is 60, talked about being selected for the religious freedom job at a news conference on Thursday. "International religious freedom is going the wrong way," Brownback said. "There's more persecution, not less, that's taken place over the last 20 years." Brownback was a U.S. senator in 1998 when he was a lead sponsor of the International Religious Freedom Act. The bill was signed into law by then President Bill Clinton, a Democrat. The legislation called on the U.S. government to help people persecuted in foreign countries because of their religious beliefs. The law created the ambassador-at-large position for which Brownback has been nominated. It also requires yearly reports on the state of religious freedom across the world. In 2016, the State Department reported a decrease in religious freedom from the year before. The report blamed a growing refugee crisis, political divisions and economic problems for the drop in religious freedom. It reported barriers to religious freedom in Pakistan, Mauritania, Sudan, Saudi Arabia, Azerbaijan, Iran, Angola, Bahrain and the Central African Republican. 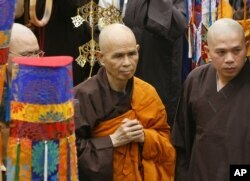 In this file photo, Vietnamese Zen master Thich Nhat Hanh, center, arrives for a ceremony in Ho Chi Minh City in Vietnam. Vietnam's communist government has had difficult dealings with religious freedom. When the Senate will take up the Brownback nomination has not yet been announced. If he is approved, Brownback will give up his job as Kansas governor. He would be replaced by the lieutenant governor, Jeff Colyer. Colyer is a doctor and, like Brownback, a Republican. Brownback was elected governor in 2010, and later won passage of big cuts in Kansas taxes. But the tax cuts led to cuts in services. The state’s education system was hard hit. In June, the Legislature brought back most of the taxes that were cut. Susan Wagle is president of the Kansas Senate. She has disagreed with Brownback on budget and tax issues. She commented on Brownback’s decision to resign as governor and take a new job in Washington. “This position will be a good fit for Governor Brownback, a staunch defender of religious freedom. I’m sure he will do a great job,” Wagle said.